"It’s important to go in with eyes very wide open." You and your salary are the biggest drivers for meeting your financial goals. But sometimes life happens, and you want to—or need to—take some time away from work. I get it. I’ve taken a few career breaks myself. When I became pregnant with my son, I was an investment banker, and I came to the conclusion that there was no way I could gestate him and work those hours. So I quit and went home… without a job or a real plan. A year later, I found another job as a research analyst—earning around 60% of what I’d been making before I had walked away. It eventually turned out really well because I loved being a research analyst, but I had never imagined I would take that kind of pay cut. Despite those unappealing prospects, in another poll, we found that 30% of professional women had taken a planned career break, 25% had taken an unplanned one and 11% plan to take one at some point in the future. Clearly, taking time off is a consideration in the majority of working women’s lives. But it’s important to go in with eyes very wide open and recognize the financial trade-offs that come with a career break. First, let’s quantify the cost of a career break for Elle. Let’s say Elle is a 30-year-old professional woman, earning $85,000 a year. She saves 20% of her salary and stashes it in the bank. She plans to take a two-year career break in five years. When she returns, she takes a 20% pay cut. And it impacts her every year for the rest of her career, since she’s getting raises off of a lower base. How much does this cost her, in aggregate earnings, over 40 years? $1.7 million. That’s how much less she earns over that period of time. And where does this leave her as a grandma, when she retires? About $400,000 poorer. (If Elle puts 20% of her salary into a savings account, she would have saved $1.5 million over 40 years. If she takes a career break, her savings would amount to only $1.1 million…so this matters…a lot.) And that’s before you take into account lost health insurance, Social Security contributions and other employee benefits while she is away. 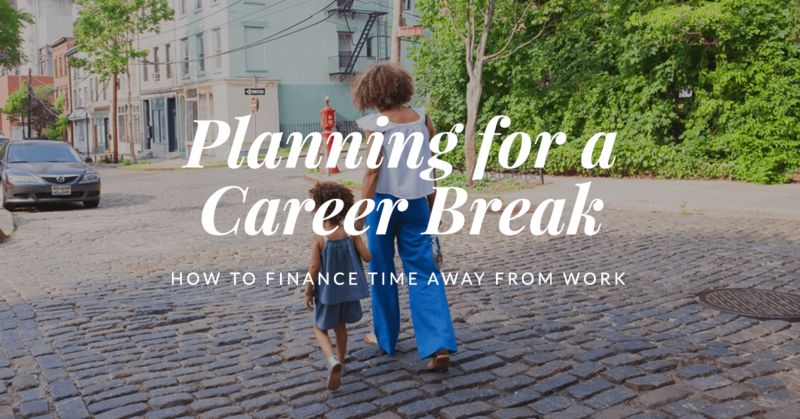 So what can you do if you want to take a career break? Like your other life goals, you should plan and save for it. In this case, you should make sure you have more than enough money set aside to cover you for the duration. You should already have an emergency fund, which should hold enough cash to pay for at least three months’ worth of necessities. Definitely beef up your savings beyond that. If you want to take a yearlong hiatus from work, if possible, save at least enough for that year plus three months before you put in your notice. If you’re married and plan to rely on your partner’s income to cover expenses, test the wheels first. Before you quit, try living on the one income and put 100% of your pay into your emergency fund. You’ll find out soon enough whether your plan is viable. Also consider how you might be able to pull in extra cash during your break. Perhaps you could take on some freelance work or pick up a part-time gig. Maybe you have some investments that are earning income. And be sure you’re ready to cut back on your expenses as much as possible. Finally, you may want to find ways to fill your resume while you’re not working full time. Freelance or part-time work can do the trick while earning you some extra income. You can also volunteer for a cause that’s important to you. Or consider starting a blog about your area of expertise. But the biggie? Invest regularly. That can be the power of investing regularly and having the investments grow over time.